As we get small, we might send striking birthday greetings to Victor Vasarely; he was born on this date in 1906. Vasarely attended medical school in Hungary before giving it up to study academic painting in Paris, where he became an advertising and graphic designer, painting on the side. 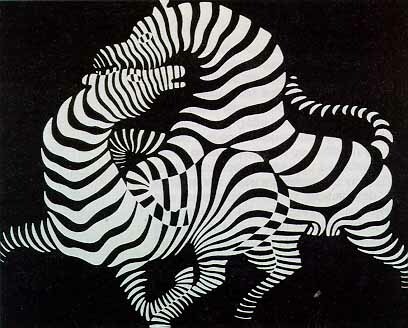 His 1937 painting, Zebra, is considered one of the earliest (if not indeed the earliest) example of Op Art— a movement of which he is widely accepted as both “grandfather” and leader.